Painted this year, I love the subject matter, the colors, bark detailing and the way the light shines on the trunk. Notice the perspective to give great size and the looseness of stroke. Italian born, initially British trained at WQEII College prior to attending Leicester Polytechnic and Graduating from The Art Center College of Design in sunny Pasadena, California. From a very young age I have had a pencil or paintbrush in hand. When ten my work was hung in The National Gallery in London, thanks to being the winning entrant in a national art competition. Since then the'Art' bug has never faltered. I have been involved with art or design, in one way or another, my whole life. My love for Art and Design is unbridled. Product, Automotive design, Graphics, Art and Illustration. They all go together like a hand in glove. Even in corporate life I have always tenaciously been able to remain involved. After working in England and Italy for many years, my wife, kids, cat and dog have finally been able to make a home and studio in beautiful Northern California, not far from Sacramento. My art resides in many countries, from Australia to China, from Europe to of course the good old USA. I enjoy painting in a loose'photo illustrative' style in mixed media, but have utilized many styles and used most everything including oils and acrylics. My love for the mechanical has helped me develop my automotive art skills. The sense of speed, the atmosphere, the weather, the reflections, the aura. All challenging to capture but always fun and incredibly rewarding if done properly. I only wish I could paint the smells and sound. I also very much enjoy the freedom, variety and freshness of painting landscapes. The variety of color, lighting, the way the shadows are cast, the unbridled beauty and majesty of. All my work is original and hand rendered. No Adobe Photoshop, Illustrator, In Design or prints, by any fancy name. Always using the finest materials available and sealed to last a lifetime and more. Each is signed front and back, titled and dated. All my work bears the Art by Ippaso seal of originality. Should you want something custom rendered. Few things give greater pleasure to a'petrol head' than having one's own vehicle painting hanging in a favorite spot. Not one like it, but actually the one, the wheels, license plate and with all those little nuances that have cost so dearly and taken so long to obtain! And nothing, but nothing makes a better gift. Visit my website at Art by Ippaso. Landscapes, portraits and animals, I find truly relaxing and a pleasure to paint. Again, just send me an image of what you would like painting. Whether your favorite spot, house, pet, wedding photo or just about anything, I always enjoy exploring possible commissions, discussing sizes and all things art. There is absolutely no obligation on your part. Thank you for your interest. 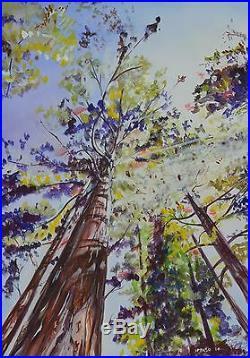 The item "Art by Ippaso Original Mixed Media'Giant Redwood' Trees in Yosemite Painting" is in sale since Friday, May 30, 2014. This item is in the category "Art\Paintings". The seller is "artbyippaso" and is located in El Dorado Hills, California. This item can be shipped worldwide. Size Type/Largest Dimension: 40" x 30"